Elton John doesn't seem like a natural choice to write for a Disney musical, but he rose to the task on The Lion King, transcending his usual penchant for the softest of soft rock. Sir Elton's collaboration with Tim Rice (former writing partner of Andrew Lloyd Webber) helps connect the soundtrack to the theatrical lineage of all Disney musicals--so much so that, like Beauty and the Beast, The Lion King was eventually adapted for Broadway. Undistinguished songs like "Can You Feel the Love Tonight?" are far outnumbered by stirring, stately tunes that lent the film so much of its sense of pageant and play. 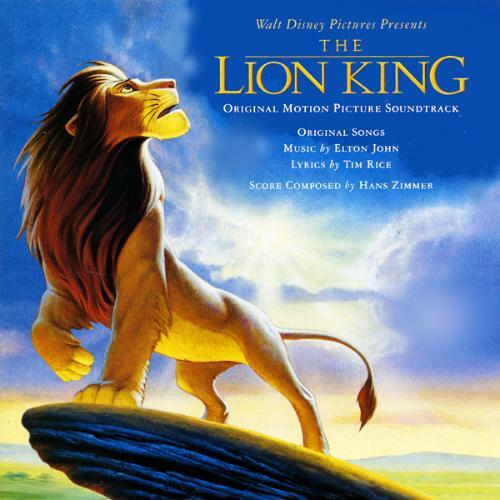 The Lion King Original Motion Picture Soundtrack has sold over 10 million copies in the United States and went 10x Platinum in 1995, becoming the biggest selling soundtrack ever from an animated film. The Lion King Original Motion Picture Soundtrack won 2 Academy Awards: Best Original Score and Best Original Song (Can You Feel the Love Tonight). It had 2 other nominations for Best Original Song (Circle of Life and Hakuna Matata). The soundtrack won 2 Golden Globe Awards: Best Original Score and Best Original Song (Can You Feel the Love Tonight). It had 1 other nomation for Best Original Song (Circle of Life). The Lion King Original Motion Picture Soundtrack was also listed as the number-one album in the Billboard 200 of Billboard magazine from July 16 - September 16, 1994 and April 29 - May 5, 1995.